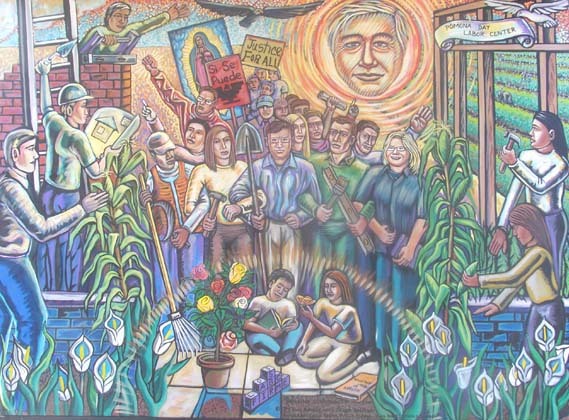 The mission of the Pomona Economic Opportunity Center is to provide an opportunity for day laborers, household workers and other low-wage workers in the community to find safe work at a fair wage, to organize and advocate for themselves in relation to policies that impact their lives, to obtain new trades and skills that improve their employability and quality of life, and to improve the overall conditions for all immigrant workers. To achieve these goals the PEOC engages in a variety of activities including labor rights education and employer mediation, job development, health and safety trainings, improving access to resources in the local community, coalition building, providing educational opportunities on workers rights and immigrant rights, vocational trainings, identifying training opportunities in work and language skills, development of strong workers and community leaders through organizing and trainings, immigration document preparation and advocacy to promote or change policies that impact low-wage immigrant workers. In addition to its main site in Pomona, the PEOC organizes day laborers among informal street corners in the Inland Empire in the cities of Rancho Cucamonga, San Bernardino, Corona, Moreno Valley and Riverside. The City of Pomona, like other cities in Southern California and across the nation, has the challenge of assisting people seeking temporary employment. For a host of reasons, ranging from downsizing and layoffs to lack of education and professional skills, day labor is an option of last resort for individuals looking to support themselves and their families. Day labor is one last option many people have before opting to public assistance for their upkeep and well-being. The City of Pomona has been key in the establishment and development of the Center, along with support from various private foundations including the Liberty Hill Foundation, the American Civil Liberties Union of Northern California, the California Department of Social Services, Immigrant Legal Resources Center. Weingart Foundation, County of Los Angeles, The California Endowment and others. we’d like to be able to help you and provide these services for you to clean house. If you haven’t done so already, please feel free to call us at (909) 397 4215 between 7 AM and 2 PM Monday thru Saturday to help.